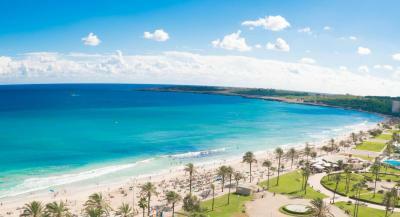 Lock in a great price for Sentido Playa del Moro – rated 9 by recent guests! We had a very pleasant stay. The rooms were a little small, but the beds were very comfortable. The breakfast buffet was great for our kids, and we enjoyed the indoor pool. The beach just outside the back of the hotel is gorgeous with soft sand. We want to come bck when the water is warmer. Everything was perfect, really satisfied, hopefully return back soon. All staff where friendly and accommodating, the food quality and choice exceeded our expectation, the cleanliness of the hotel was very high standard. There was entertainment day and night. The spa was available to all, not just adults. We were allocated a table for evening meal that was ours for the duration of our stay. Central location, on the beach , great views. Staff were very friendly. Very clean and food very good. +++ perfect location +++ close to the beach as possible ++ big variety of food ++ nice pool area +++ very clean +++ you can find free sun beds around the pool, (dont have to spend/try to find beds on the beach) +++ nice bar (pool area) This was the 5th time we were in Cala Millor and the 1st time in this hotel. This is a nice price/value hotel on the best place on the beach. 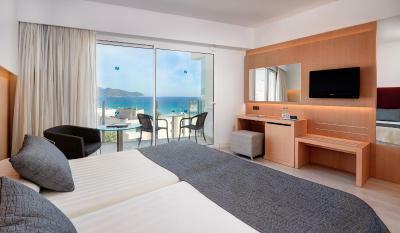 Compare with Vista Blava, Castell de Mar, Voramar we highly recommend Playa Del Moro. When we arrived we were given a glass of champagne and a glass of orange which was very welcome.On arrival we were given an up grade to a junior suite.The room we had overlooked.the pool.It was spotlessly clean.Also the bed was so comfy.We had half board and the food was really good with lots of choice and different most days.The Hotel is in an excellent position right next to the beach. 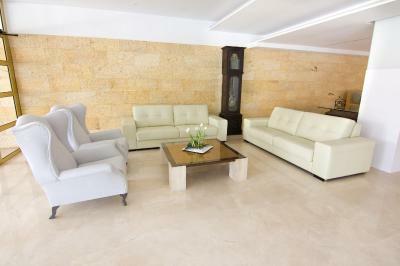 Also the staff were very pleasant .Overall a very pleasant stay .Would defiantly stay again. 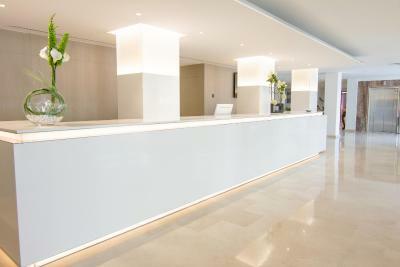 The staff are really fabulous - very friendly and attentive. The room was spotless with a very comfy bed, great shower and excellent housekeeping that were never intrusive (it's like they knew when we'd left the room for the day!) There was nothing about this hotel that disappointed. 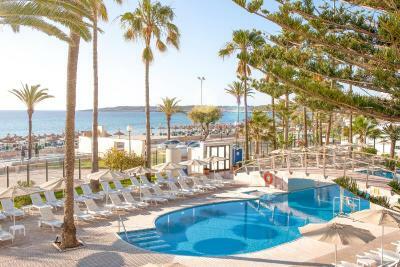 Sentido Playa del Moro This rating is a reflection of how the property compares to the industry standard when it comes to price, facilities and services available. It's based on a self-evaluation by the property. Use this rating to help choose your stay! One of our top picks in Cala Millor.Sentido Playa del Moro offers indoor and outdoor swimming pools, a hot tub and a fitness center. 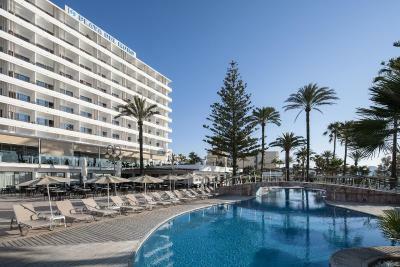 The hotel is in a pedestrian area of Cala Millor, right on the seafront. 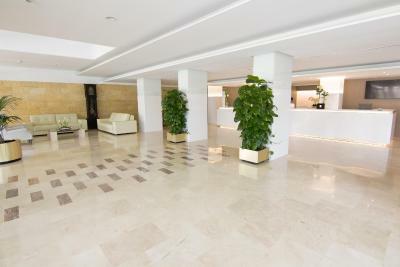 Rooms at the Sentido Playa del Moro are air conditioned and spacious. They all have a private balcony with sea views. Rooms also have a mini-bar and a safe for a surcharge. 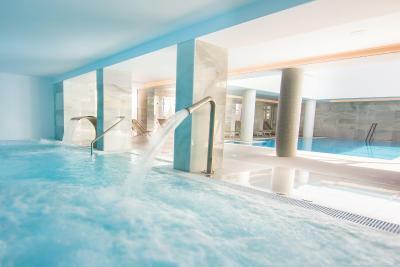 Sentido Playa del Moro offers a sauna, Turkish bath and massage service at an extra cost. 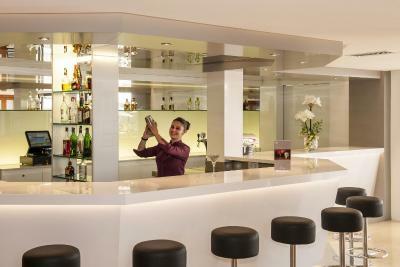 The hotel also has a bar and a garden. The restaurant offers international and Mediterranean food. 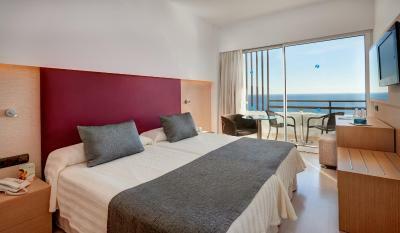 The hotel is in a quiet street in the center of Majorca’s Cala Millor. 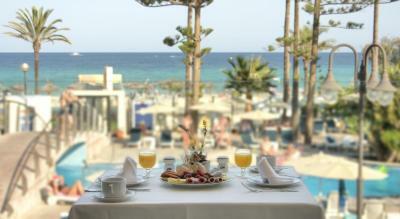 When would you like to stay at Sentido Playa del Moro? 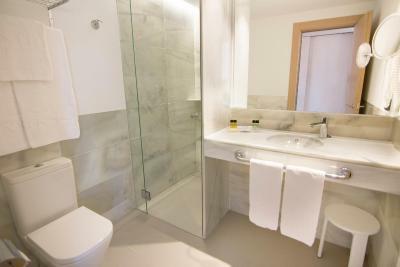 This bright spacious room features a private balcony and a bathroom with a bath tub. This bright, spacious room features a private balcony, sea views and floor-to-ceiling windows. It has 2 single beds and an extra bed. There is a bathroom with a bath tub. 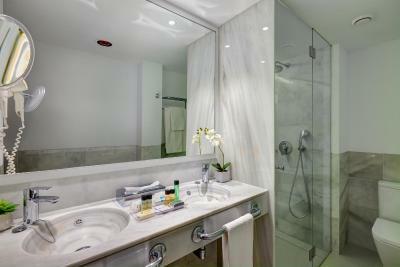 This bright spacious room features a private balcony and a bathroom with a bath tub. It has 2 single beds and an extra bed. 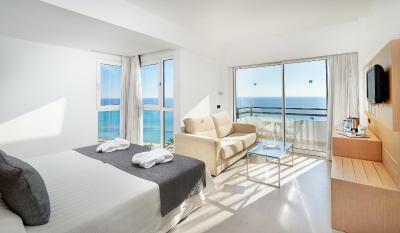 This bright spacious room features a private balcony, sea views and floor-to-ceiling windows. There is a bathroom with a bath tub. 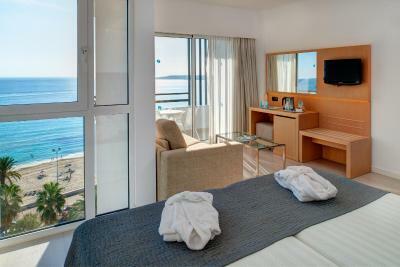 This bright spacious room features a private balcony, sea views and floor-to-ceiling windows. There is a bathroom with a bath tub. It has 2 single beds and an extra bed. This bright, spacious room features a private balcony, sea views and floor-to-ceiling windows. There is a bathroom with a bath tub. It has 2 single beds and an extra bed. This suite features a balcony, air conditioning and mini-bar. 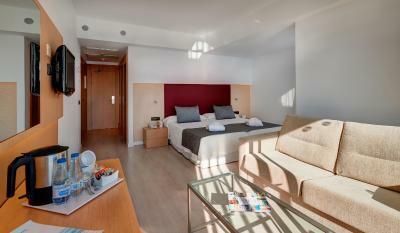 This suite features a balcony, mini-bar and tumble dryer. 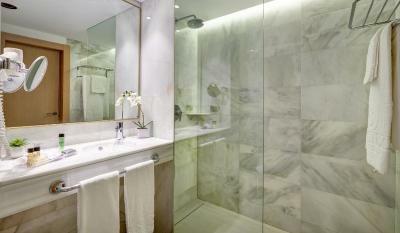 House Rules Sentido Playa del Moro takes special requests – add in the next step! 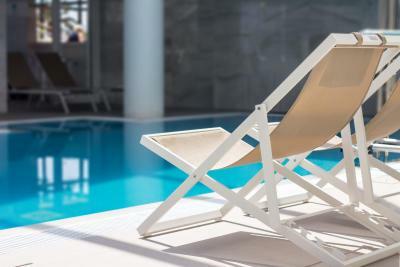 Sentido Playa del Moro accepts these cards and reserves the right to temporarily hold an amount prior to arrival. 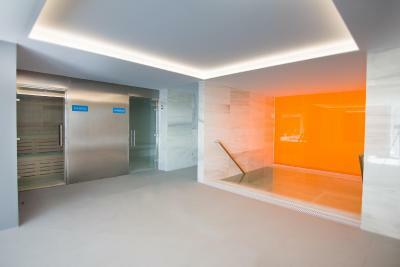 Please inform Sentido Playa del Moro of your expected arrival time in advance. You can use the Special Requests box when booking, or contact the property directly using the contact details in your confirmation. Parking at time was difficult on the street. We also weren’t made aware of the half-board option to add to our stay via booking.com, but added it when we got there and enjoyed the dinner. Outdoor pool is not warm enough to swim in during April. Also, we had two rooms and both bathrooms had a funky smell. The town itself it’s a crowded location. It depends what you are looking for. We don’t like sitting at the same dinner table every night. Restaurant staff were unsociable. Chef unable or unwilling to cook poached eggs for breakfast! If you are holidaying for a culinary experience then don't bother. Food was set out nicely and looked inviting but was tasteless and was sometimes in short supply. Lack of a la carte option did not help things either. The bridge over the pool was slippery caused by people coming off the beach with sand on their feet.Their is a hotel rule which says no swimming or towels left before 9 am If the towels were left for more than half an hour they would be removed.People were swimming before that time and towels were arriving at 6-30 and staying there all day.Another rule was no shorts at evening meal.Of course nothing said.Would have been nice to have a sunbed during our stay even for an hour.